The Retro Bin: The Flintstone Comedy Hour (1972) | TWINSANITY! 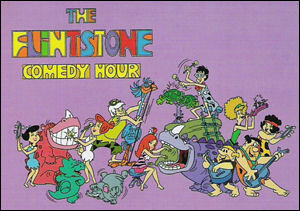 Today’s Retro Bin takes a look back at the CBS Saturday morning cartoon The Flintstone Comedy Hour (not to be confused with The Flintstones Comedy Show, which ran on NBC in 1980). Rather, this show ran a season after Pebbles & Bamm-Bamm, the 1st Flintstones spin off where the title duo were magically transformed from toddlers to teenagers. Voiced respectively by Sally Struthers and former child actor Jay North of TV’s Dennis the Menace (the black and white sitcom, that is) fame. I don’t think that I need to explain the premise here; it’s the flippin’ Flintstones. The franchise has been around longer than Europe and if you were a kid in the 1970s, watching syndicated reruns of The Flintstones was just something that you did, like brushing your teeth or making your bed. We all know who these characters are and what this show is about, so instead, I’ll explain this particular venture: This series was made right after season 1 of Pebbles & Bamm-Bamm, so it picks up where that series left off. It was basically done in a variety show format (remember that this was 1972, and that genre of programming was still alive and kicking at the time). The 1st half hour consisted of new segments starring Fred and Barney, as well as jokes, skits and vignettes starring Pebbles (this time around voiced by Mickey Stevens instead of Sally Struthers, who by this time was fully committed to her role as Gloria Bunker-Stivic on CBS’ All in the Family), Bamm-Bamm, Wiggy, Penny, Moonrock, The Bronto Bunch and Bad Luck Shleprock, while the second half hour consisted of 4 new episodes of P&BB combined with reruns from the previous season. Also, this was the last Flintstones spin-off where Alan Reed voiced Fred. Mr. Reed passed a away in 1977. Beginning with the syndicated Fred Flintstone and Friends (which debuted in October, 1977), Henry Corden took over the role of Fred and continued to voice the character until his own death in 2005. “We’ll have groovy time”? Really? That opening couldn’t be more 70s if it had been recorded in a boogie van that had love beads over the doorway! That said, when I saw these episodes again in reruns as a teenager in the 1980s, I totally wanted to “Yabba Dabba Doo” teenage Pebbles. The 1st half hour was more or less a Laugh-In retread; with the characters performing in blackout gags, performing in short skits and telling groan worthy jokes. Such as one bit in which Zonk (of the Bronto Bunch) is trying make himself remember the name of the 49th State (Alaska) because he’s sure that his teacher Ms. Gravel is going to ask him to name it. In class, Ms. Gravel throws Zonk a curve by asking him to name the 50th State. Unprepared for this, Zonk stammers “Huh? Why…uh…” and Ms. Gravel answers “That’s correct! Hawaii (pronounced “Huh-why-uh” in order for the joke to work)!” A corny joke and perfectly harmless, except that the show is set in the Stone Age! Several centuries before the Colonies were formed. Logically, they should all be living on 1 big rock called Pangea or something similar. I really shouldn’t try to approach these kinds of things logically. Undoubtedly the worst part of the show was the performances of the band The Bedrock Rockers (actually Pebbles, Bamm-Bamm and their friends) performing cheesy pop songs that were so unbelievably tame that they made the Archies look like Def Leppard. It was like a senior citizen’s version of a teenage rock band. Even for the early 70s, The Bedrock Rockers were about as hip and contemporary as Guy Lombardo. When the Osmonds tell you that your act is too squeaky clean, that’s not a good sign. Anyway, the show returned in the fall of 1973 reduced to a half hour because the P&BB episodes were omitted, so it was then titled The Flinstone Comedy Show. Then 4 years later, many of the segments were recycled for the syndicated Fred Flintstone and Friends, including the Bedrock Rockers numbers for some reason (seriously, my ceiling fan makes better music) and many other Flintstones spin-off series would be produced by Hanna-Barbera over the next couple of decades (including the I-can’t-believe-this-actually-got-made concept Fred and Barney Meet the Thing, which we may be tackling here some time in the future). Until recent years, there was never a gap longer than 2-4 years before a new Flintstones TV show or special was produced, and even now the characters are still appearing in Pebbles cereal commercials. Warner Brothers (which absorbed H-B in 1999) is working on a Flintstones DTV in which the characters appear with WWE wrestler John Cena. The joke here is that this isn’t a joke. It’s really going to happen. As long the characters don’t sing, we should be OK. I think the whole point behind the Bedrock Rockers was that they were H-B's other answer (along with Josie & the Pussycats) to the Archies, even though all three bands were on the same channel! The lyric change in the theme song might've been for political correctness, even then, for all we know. When they revived the series in 1980, they had Pebbles & Bamm-Bamm take Dino along on Scooby-Doo-esque mysteries. Blame that on NBC, which picked up the Flintstone franchise. BTW, that Flintstone-WWE movie? Due in 2015, after Cena & friends have met Scooby. Prepare to pass the Pepto! Brain Candy: Yabba Dabba Done | TWINSANITY!